← 2015 Honda Elsinore or Africa Twin? 500 or 1,000? Both? Neither? 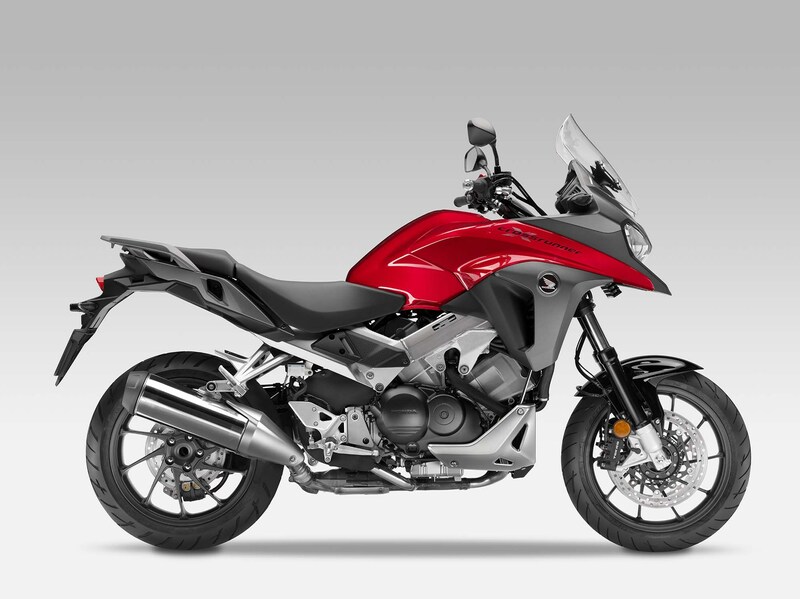 2015 Honda VFR800X Crossrunner: What it is. What it isn’t. What was the bike the “Honda magician” revealed on September 10th? It wasn’t the much anticipated New Africa Twin. Instead, it was an upgrade to the VFR800X Crossrunner, a motorcycle not marketed for the United States. What was so impressive about this upgrade to deserve this unveiling, and why does it matter to the Adventure segment and the anticipated new Africa Twin? “The heart of the machine remains its VTEC-equipped 90° V4 DOHC 16 valve engine, which now offers increased low and mid-range torque for flexible, effortless drive, plus increased peak power of 105bhp, delivered at 10,250rpm. “The aluminum twin-beam frame features a lighter, revised subframe and new aluminum swingarm – another VFR signature piece. Suspension has longer travel: 25mm in its two-piece telescopic forks and 28mm in the rear shock. ABS comes as standard and the front 17-inch hollow-cast aluminum wheel is fitted with dual 310mm discs, worked by radial-mount four-piston calipers. Tires are sporty street-size 120 front and 180 rear for optimal on-road performance. With these changes, the 2015 Honda Crossrunner pushes further into the adventure side of the touring equation, making the Crossrunner an attractive sport/ADV model from Honda. Ducati launched the Multistrada line in 2003 and eventually discontinued its Sport Touring (ST) line in 2008. 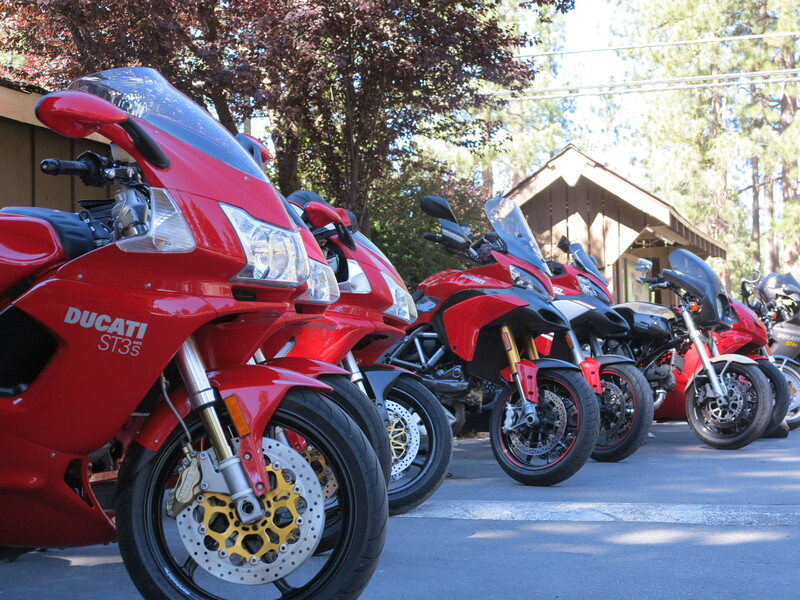 In 2010 Ducati launched the MTS1200 with four riding modes: enduro, urban, touring, and sport. The Multistrada has ergos that would be suitable for an enduro bike, but it has a motor from a super-bike and it is fitted with 17 inch wheels. Whether you call it a Touring or Sport bike, or even an oversized super motard, it is viewed as an Adventure bike. 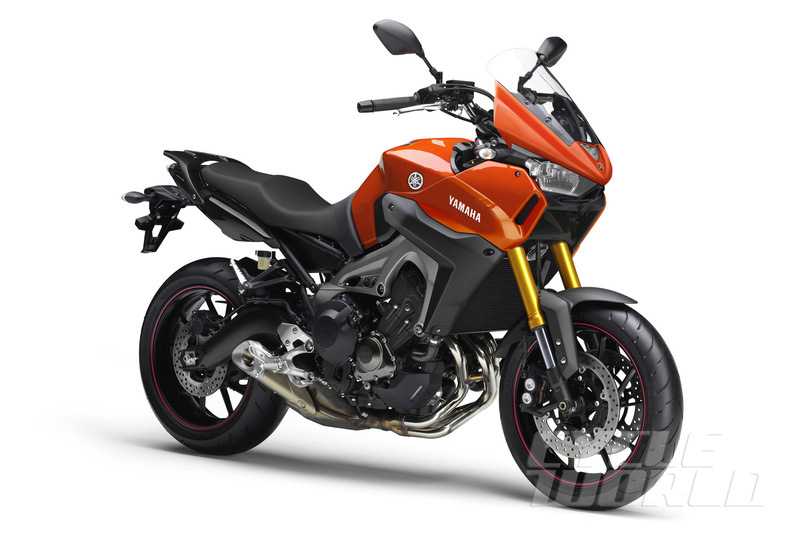 It was part of the movement forming the Adventure Touring or Sport Adventure segment within adventure bikes. On the October 2014 edition of “Motorciclist” they ran an Adventure Tour comparo. 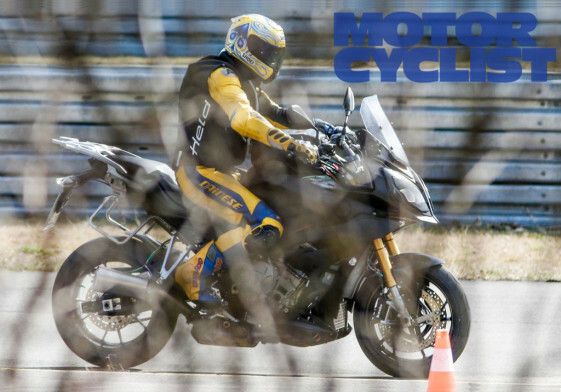 The bikes in this set were the Aprilia Caponord, the Ducati Multistrada, the Suzuki V-Strom 1000, the KTM 1190 standard, and the BMW R1200GS. This was the street end of the adventure segment that we can call touring or even sport adventure. This new Honda would fit just right for this comparo. 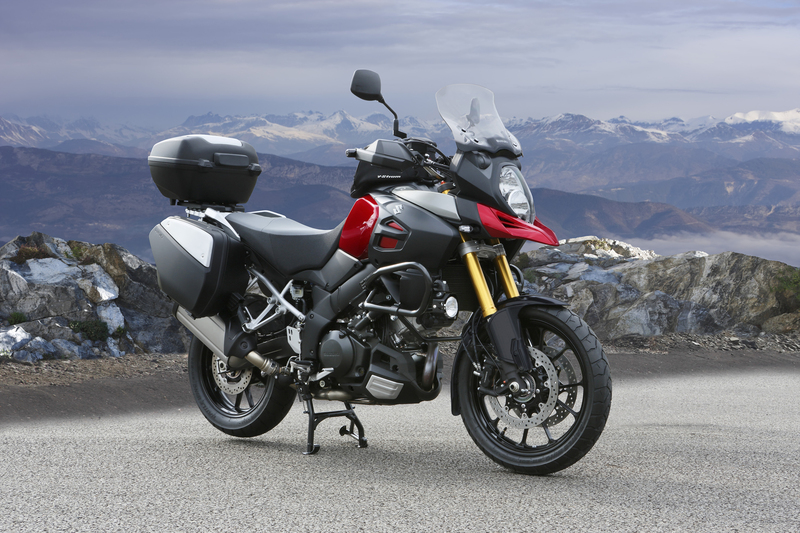 Although with a smaller displacement, it would not fall behind the V-Strom necessarily. And the Aprilia and the Ducati have 17-inch front wheels. The Honda VFR1200X Crosstourer would probably be a better fit for this comparo, but the point is, this revised VFR800X is as deserving of being called an “Adventure” bike as the V-Strom, the Ducati, and the Aprilia are. At the same time we hear Yamaha is also making an investment on this area of the market. We hear a more upright version of the FZ-09/MT-09 with its triple motor will be presented in a few weeks at the Intermot meeting in Cologne. At least two illustrations of what this bike could look like have been circulating on motorcycle sites. One of these illustrations associates this new bike with the TDM name. Just imagine bags and these bikes will look adventuring touring. Or sport adventure. And don’t forget the “adventurizing” of the BMW S1000RR with its in-line 4 motor that has also been circulating. But in the case of BMW these are real photos of prototypes, so it goes beyond pure speculation. Although sport should be this bike’s emphasis. 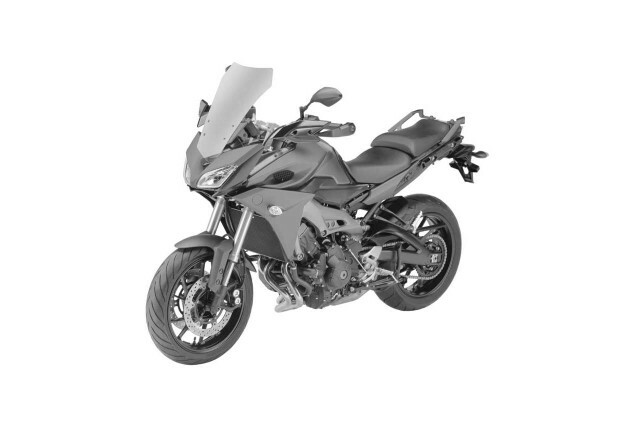 In other words, it is just one more bike entering with a more solid foot in what we call adventure motorcycles, and for the other, it is the adventure segment being stretched to include a touring component. These are motorcycles offering upright ergos, good amount of suspension travel, good on road performance for long distance travel, but with a motor delivering “sport” performance. Some of them are probably good enough for gravel roads. Adventure enough to go to Alaska, for example. There is a “number” circulating on several sites and forums, claimed to be from Yamaha, stating that less than 20% of Super Ténéré owners take their bikes off road. All these riders want, it seems, is a bike that is comfortable for touring and maybe ready for a side road adventure. Why not build a bike that more clearly fits this street adventure rider profile? Honda seems to be getting it with its X line. The question is: will this bike look badass enough for those times when you park it in front of the Starbucks to get a cup of decaf salted caramel non-dairy latte while dressed in your full enduro regalia? Unfortunately this VFR800X will not make it to the American market. It seems like a really nice motorcycle, with just enough power to be lots of fun, and not too heavy or over-sized. Just right with the appropriate amenities and electronic features. I bet it is a good Adventure Tourer and probably competitive on this segment of the market. What about the Africa Twin? So what happened to the Africa Twin, you may ask? We have enough information to give us a good amount of certainty that the Africa Twin is still coming. And we believe this more adventurized VFR800X actually solidifies the perspective that the new Africa Twin will be a real enduro motorcycle. Or will be capable of it with some minor modifications. Let’s take a look at Honda’s X line: they have the CB500X, the NC700/750X, the VFR800X and the VFR1200X. They form a nice gradient, based on size, of street oriented adventure or adventure-styled bikes. What’s missing from this line up? Exactly, what’s missing is an enduro version. It just may be that as the VFR800X gets more adventurized, the more likely it will be that we won’t see an Africa Twin that overlaps too much with it and these other X bikes. That is, we may see a real enduro bike coming up from Honda, something that will definitely not belong on this soft X line. 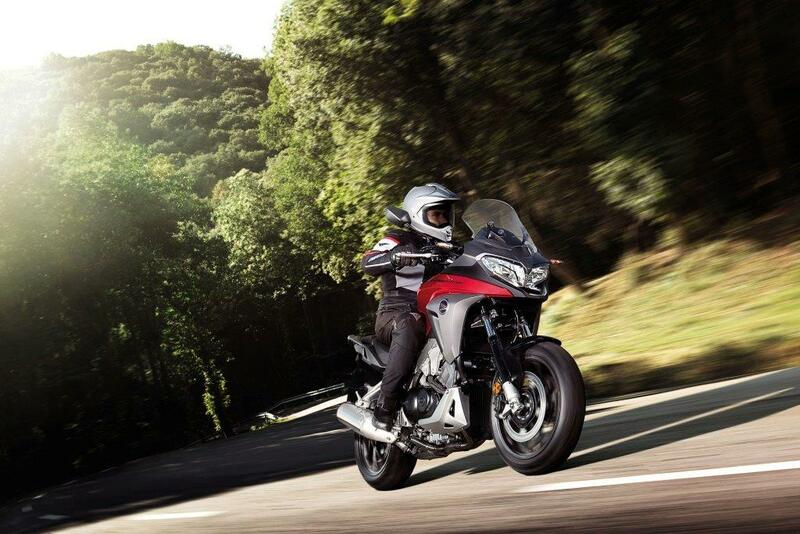 Having said that, we would be surprised if Honda unveils the Africa Twin in the upcoming Intermot and EICMA shows. Honda would not unveil this bike without milking such a launch with strategies that are more effective, on a longer term and more widespread than the magician’s reveal of the VFR800X in a German site. We think at this point it may be something for next year, but we hope to be wrong. We keep our hopes up for a great enduro machine from the big red. Or two, who knows, it would be cool to see a smaller Elsenore alongside the proper Africa Twin. This entry was posted in Bike Reviews and tagged 2015 Africa Twin, Africa Twin, Crossrunner, VFR800X. Bookmark the permalink.